The Stage, Disability Arts Online, and Sparklewheels on In Water I’m Weightless. I started this blog a year ago, wanting to document process and hopefully reveal some of the skills and experiences I as a dramaturg/performance writer may go through when making work in a broad range of styles. I also want to have this as a place for discussion and reflection – dialogue, if you like. 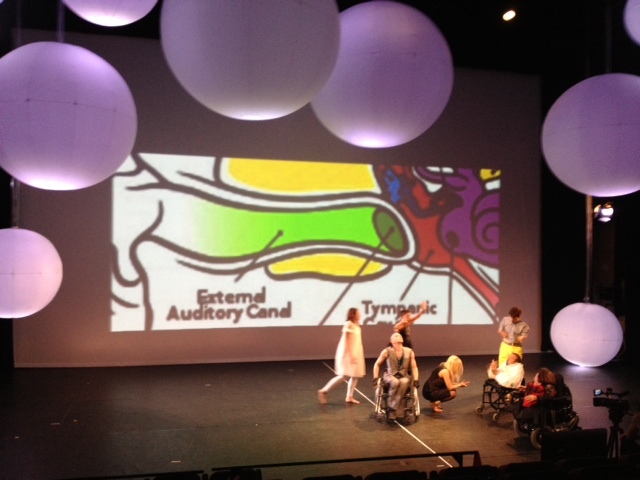 My most recent production, In Water I’m Weightless, with National Theatre Wales, closed at The Purcell Rooms, Southbank Centre, London, as art of the Cultural Olympiad and celebratory Unlimited Festival, between the Olympic and Paralympic Games. I am now working in Berlin, but receiving more reactions to the work – interviews, reports, and reviews. I will partly reproduce them here, with the link to the relevant website so you can read further, if you so wish. What follows is a mixture of opinion and perspectives – from the so-called ‘mainstream’ speciality industry publications (The Stage), disability culture (DAO) and a personal blog, informed by a disability perspective (Sparklewheels). It might be an illuminating mix! A decade ago, Kaite O’Reilly, the award-winning playwright, poet and disability arts campaigner, created a stir. Peeling, the darkly comic play she had just written for the Graeae Theatre Company, proved groundbreaking enough, but some of the language used to champion her views on disability in theatre, must have caused a fair few in theatre to undergo some soul searching. Speaking to O’Reilly recently in-between rehearsals for her new show, In Water I’m Weightless, there’s clearly still a burning belief that what the international dramaturg, author, mentor, tutor and honorary fellow at Exeter University said all those years ago hit the bull’s eye. “One of the lines from that play has become a slogan,” she reflects with palpable pride. “What I said 10 years ago was that ‘cripping up’ had become the new, 21st century answer to blacking up. You know, that Richard III thing when someone pretends to have a hump or lose a leg, and so on. Mental health, disability and impairment roles are in so many plays, but invariably still played by non-disabled actors pretending to have that disability,” she says. The official image of Unlimited Festival by the superb Sue Austin. After an acclaimed run in Cardiff, National Theatre Wales and a cast of deaf and disabled performers brings the award-winning Kaite O’Reilly’s ‘In Water I’m Weightless’ to London as part of the Unlimited festival at the Southbank Centre.But how did such an imaginative, poignant and funny work come together? 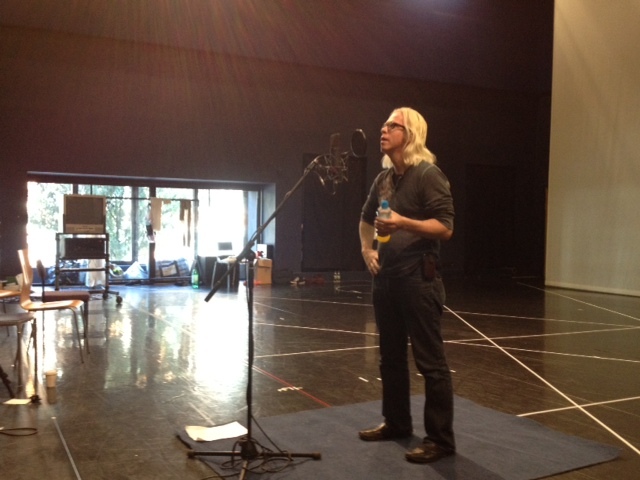 Paul F Cockburn, dropped in during the final week of rehearsals last July. The morning DAO drops in on rehearsals, the cast have been working on In Water I’m Weightless for four solid weeks. With opening night now only a few days away, the momentum is palpable as the show’s ensemble cast — Mandy Colleran (who has to drop out after injury), Mat Fraser, Karina Jones, Nick Phillips, Sophie Stone and David Toole — physically flex and warm their bodies to the soundtrack of Michael Jackson’s Thriller. The morning, according to NTW Media Officer Catrin Rogers, will be spent primarily doing ‘tech’. This is the first time the cast have been given their costumes, so the focus will be on going through the ‘tops and tails’ of scenes, focusing not on performance but the practical issues of stage positions and costume changes. Director John E McGrath underlines how the cast should raise any issues they have from this process, not least visually impaired Karina Jones, who at one point has to dance in a big dress while wearing high heals. She’s up for it, but there are concerns: “You have a go at everything, because you’re fearless,” John tells her, though he later wonders if the question of her shoes will “haunt the whole production”. The afternoon is dominated by the first proper run-through of the piece that brings together not just the cast but also the technical team with the music, soundscape and visual projections which are an integral part of the show. “Focus on meaning, on the work that’s been done on a scene,” John tells the cast. “There are no happy endings. There are just run-throughs,” responds popular cast-member Nick Phillips, humorously paraphrasing what all too quickly becomes as an important theme of the work, repeated through the production. Nick is the ‘original find’ of this production. Although professionally trained as a dancer, he had given up on performance after a car accident. It was involvement in an earlier NTW production that helped change his mind. 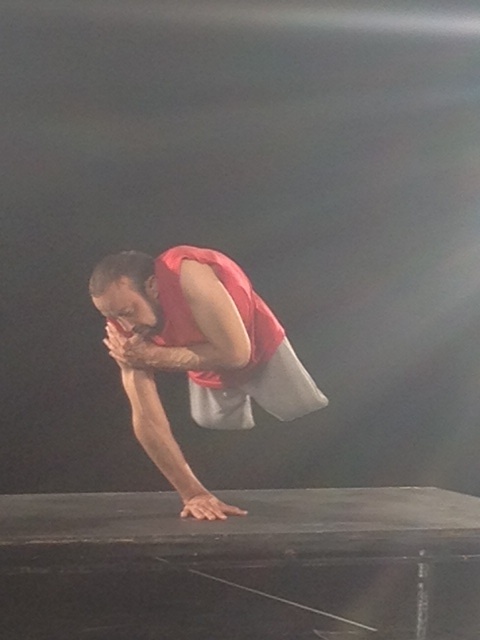 Two further reviews of In Water I’m Weightless is also on the Disability Arts Online website. Rehearsal photo of In Water I’m Weightless, by Kaite O’Reilly. Finally, the fabulous Nina of Sparklewheels.blogspot writes about the panel I was part of ‘Making work for Deaf and hearing Audiences’, plus reviews In Water… on her blog. ‘In Water I’m Weightless’ starts off like a fashion show. Pounding music and bright lights is the backdrop as the five actors enter the stage in elaborate gowns, suits and striking headpieces. The characters take turns in shouting at the audience, shouting that we are all the same, we are all mortal. After this impressive beginning, ‘In Water I’m Weightless’ goes on to explore how the story of the five characters overlaps, and how it overlaps with everyone’s story. IN the centre of the stage, two actors are discussing the roles they are usually offered. “I’m always playing zombies,” says one. “The sick and twisted psycho,” says the other. Instead, they dream of being cast as the “fish and chip customer” in EastEnders or the “waiting patient” in Holby City. For the actors – David Toole and Nick Phillips – are disabled and they’re sick of being stereotyped. Their observations are part of a series of monologues and conversations making up National Theatre Wales’ latest production, In Water I’m Weightless. Director John E McGrath has taken the words of writer Kaite O’Reilly and transformed them into a powerful piece of theatre, shattering any stereotypes. Staged inside the Wales Millennium Centre’s intimate Weston Studio, five disabled performers get their points across effectively through speech, music, film and both graceful and energetic movement. During the opening scene, we’re made aware of how life can change in a matter of seconds for any one of us and just how fragile the human body is. The monologues – which are performed in inventive ways, proving they don’t have to just be delivered from a bar stool – cover everything from growing up with a disability and strangers’ perceptions to being comfortable in your own skin. We’re reminded that almost all of the brilliant generals were disabled, including Napoleon. The performers work brilliantly together and the production, designed by Paul Clay, is slick. What’s all the more incredible is that McGrath had to completely rethink the hour-long show after cast member Mandy Colleran was forced to pull out just hours before the opening night due to injury. In Water I’m Weightless – staged as part of London 2012 Cultural Olympiad’s Unlimited programme celebrating disability, arts, culture and sport – is a thought-provoking, beautiful piece of theatre which makes you realise that everyone is unique – and equal. The show must go on – and spectacularly so…. In Water I’m Weightless. It’s a cliche, the show must go on – and we know cliches exist because they are true…. In the break before the dress rehearsal for National Theatre Wales’s production of my script In Water I’m Weightless last Wednesday 25th July, one of our performers, the phenomenal Mandy Colleran, had an accident and had to be taken to Accident and Emergency. We cancelled the first preview the following night, and, under Mandy’s encouragements, began to consider our options for the performance continuing until she was able to join us again. In Water I’m Weightless is a collage of monologues which are performed collectively, chorally, bilingually, and as solos. It is an ensemble piece, so the cast are practised in working together as one entity – but as it is an ensemble, Mandy’s absence was sorely felt. Swiftly Sara Beer, John McGrath, and I re-allocated the lines, making edits, shifts, and cutting one scene. Overnight the actors – Mat Fraser, David Toole, Karina Jones, Nick Phillips and Sophie Stone – learnt new scenes and staging – appearing virtually word-perfect the next morning for rehearsals. John worked us chronologically through the script, the technical crew and cast adjusting, amending, reinventing, but always staying true to the original concept and interpretations of the text. We broke for lunch – the actors dotted individually around the front of the Wales Millennium Centre, enjoying the rare summer sun, sandwiches and scripts in hand, running lines, learning the new texts, whilst in the dark of the studio, designer Paul Clay and the technical crew re-edited videos and replotted the lighting design. In Water I’m Weightless publicity image. A terrific cast of deaf and differently abled performers has been assembled for this National Theatre of Wales production, written by the brilliant Kaite O’Reilly, whose LeanerFasterStronger – about the quest for perfection and what it takes to be the best – was recently seen at Sheffield Crucible. Directed by NTW’s artistic director, John E McGrath, and with movement by Nigel Charnock, the show uses O’Reilly’s poetic texts to challenge preconceptions around disability, celebrate difference, and question exactly what it is we mean by normal. 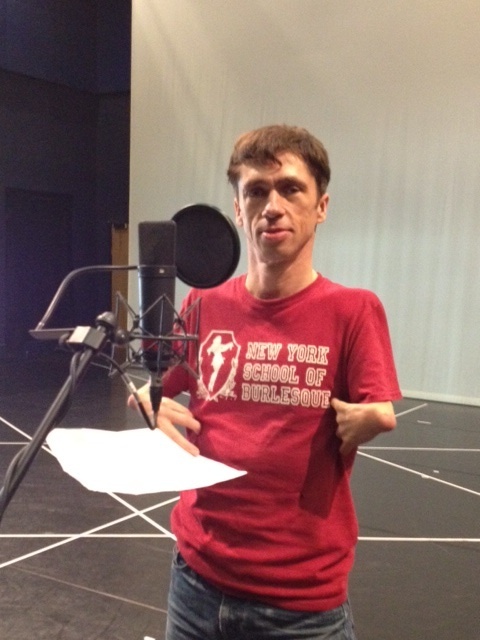 Mat Fraser recording his part of the audio description CD/download for In Water I’m Weightless. It is, I think, a most peculiar way to make a living. No two days are the same and my working life at the moment is of such a surreal quality, normally loquacious taxi drivers are silent as I outline the activity…. Still, that’s probably nothing compared to what Jacob probably said when he got home for tea that night (‘Well, I hung off the top of a ladder and had to pour a stream of water from a glass jug onto a specific mark on the bare shoulder of Karina Jones, whilst a group of men watched and filmed it’). We are in the final week of rehearsals for In Water I’m Weightless with National Theatre Wales – a week filled with media activity as well as intense rehearsals and run-throughs. It is our designer, Paul Clay, who has brought the slow motion filming and mediatised elements into the production. An accomplished designer and artist, he also live video mixes in the underground club scene of New York, where he lives. The design and visual world of the play is a response to the poetic conceits at work in the text – the weightlessness from floating in water, and the sense of freedom and liberation this creates (see my earlier blog about filming stunt dives). This is in direct contrast to the weight of prejudices, fear, and preconceptions usually loaded onto the disabled body. It was our director (and artistic director of NTW), John McGrath, who pulled out this quotation ‘In Water I’m Weightless’ from the large body of monologues I have written over the past few years, and from which the text of this montaged production is taken. This is my second show with Paul, and John. The first, Perfect, at Contact Theatre in Manchester, also had a strongly visual component and won Paul the M.E.N award for best design of 2004, whilst I won best play. It is wonderful to be back in a rehearsal room with both, aware of the growth in experience, skill, and stature since we last collaborated. Designer Paul Clay recording a description of his set, costumes, and visual/video artwork on In Water I’m Weightless for visually impaired and blind audience members. As In Water I’m Weightless is an Unlimited commission, part of the Cultural Olympiad promoting the work of Deaf and disabled artists, we are keen to make the work as accessible as possible – which brings us to the second mediatised experience of the week. Karina Jones, one of the cast, suggested we prepare a pre-show recording for visually impaired and blind audience members, so they would have a sense of some of the visual and physical aspects of the work. One performance at the Wales Millennium Centre will have live audio description (a headset is provided for audience members, if required, and during the performance a description of action and visual elements is relayed), but we were all excited with Karina’s suggestion. I provided bullet-points for the performers to use as stimulus – a description of their bodies, costumes, and the dance/movement sequences – and Paul spoke about the visuals and his design concept. Mike Beer recorded them, and this should be available prior to the show at Wales Millennium Centre as a CD, and also hopefully as a download from NTW’s website. Confounding expectations and challenging preconceptions are the avowed aims of In Water I’m Weightless – the latest production from National Theatre Wales. KAREN PRICE of The Western Mail/Wales Online met the writer and director of this provocative new work. Monologues will be delivered in a series of innovative ways when a cast of deaf and disabled performers take to the stage for an Olympic celebration. Karen Price meets the writer and director of the new production. After receiving a Creative Wales Award in 2008, writer Kaite O’Reilly decided to use the funding to explore monologues. Four years on, her project is coming to fruition in the shape of a major performance produced by National Theatre Wales as part of the Olympic celebrations. In Water I’m Weightless takes a provocative look at the body and will be staged in Cardiff and London by a cast of six deaf and disabled performers. Combining movement and live projections, O’Reilly’s poetic, poignant and, at times, humorous texts are inspired by the imagination, experiences and attitudes of disabled people across the UK. 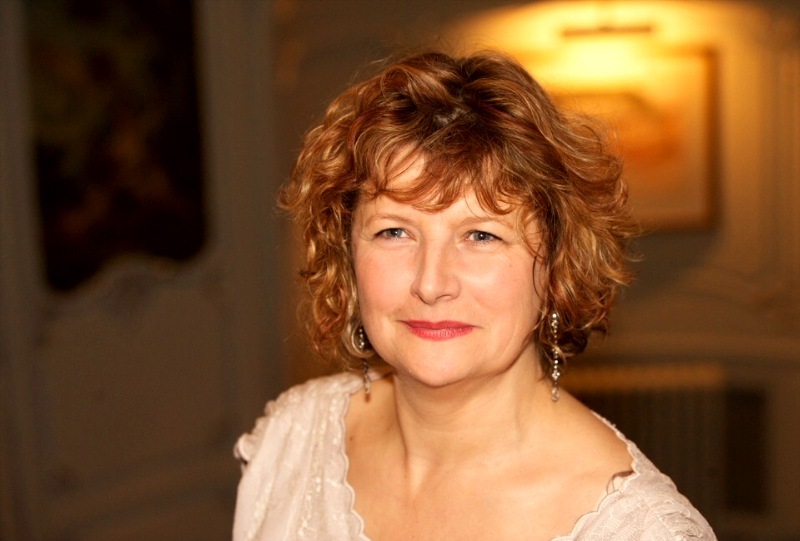 “As a playwright, I’d always written multiple parts and not approached monologues,” says the West Wales-based writer whose theatre credits include The Almond And The Seahorse (Sherman Cymru) and The Persians (National Theatre Wales). “So after receiving the Creative Wales Award I explored the form of the monologue and was mentored by various experts. I also started writing a large body of work that was specifically for deaf and disabled performers reflecting their experiences. O’Reilly spoke to John McGrath, the artistic director of National Theatre Wales about the project she was working on – they had collaborated in the past when she adapted The Persians,based on Aeschylus’ original work, for NTW’s inaugural opening season. Staged on a military range in the Brecon Beacons, it won acclaim from both audiences and critics – and Kaite went on to win the Ted Hughes Award for New Work in Poetry for her efforts. So when O’Reilly received a commission for the 2012 Cultural Olympiad’s Unlimited programme celebrating disability, arts, culture and sport, NTW were keen to come on board as producers. Directed by McGrath, In Water I’m Weightless will be staged at the intimate Weston Studio at the WMC – the first time NTW has worked at the venue – before there are three performances at London’s Southbank Centre. “It’s great to work with Kaite again on something that’s completely different from The Persians and this touches upon a lot of experiences which are rarely performed on stage,” says McGrath. In Water I’m Weightless is a multi-media performance which celebrates the athleticism of the performers through some clever choreography. It also incorporates film and music, including tracks from Dame Shirley Bassey and the Yeah Yeah Yeahs. The six cast members – Mandy Colleran, Mat Fraser, Karina Jones, Nick Phillips, Sophie Stone and David Toole – all come from different performance backgrounds and had a say on which monologues should be chosen for the production. Both O’Reilly and McGrath are keen to show audiences how theatre can break away from stereotypes when it comes to disabled performers. McGrath is collaborating once more with award-winning New York designer and media artist Paul Clay on the set and costume designs. The set itself has a big screen backdrop and a series of suspended lights onto which film footage will appear. With little over a week to go until In Water I’m Weightless is premiered, McGrath admits that the rehearsal process has very much been improvised. Mandy Colleran is an actor currently in rehearsal for the National Theatre Wales’s production of In Water I’m Weightless. I’ve known her for years as a friend and something of an inspiration. I doubt she’ll take much to the term “hero”, and I’m not so certain about it myself. Because there are dangers of applying “heroism” to people with disabilities – it is often used to portray a “tragic but brave” life, and she’s fought against that for decades as a campaigner for equal rights and empowerment. I’m sure she’d always prefer a ramp to a pedestal. But I admire her, as an actor and an activist, but above all as a bon vivant. Colleran goes everywhere and sees everything. She gets out so much more than I do – to the theatre, to talks and concerts. I suffer from the writer’s vice of withdrawing from the world. She makes that world accessible to me. She has highly tuned cultural antennae, and always seems to know what’s going on. Full of ideas and opinions, she is constantly engaged in the life around her – as a participant, not just an observer. She has an insatiable appetite for books and a direct and easy manner of criticism. She would be ideal for a review show. And she has an explosive sense of humour, with a laugh that sometimes can be heard throughout most of Clerkenwell. In any struggle against the odds Colleran often reminds me that we can do it on our own terms. One winter the snow lay inches deep in central London. I was finding it hard to get around and was suddenly possessed by the thought that she might need some assistance, if only to pick up some shopping or something. I phoned her and heard that familiar scouse voice cutting through a cacophony of shouting. She wasn’t stuck indoors, she was at a demo in the West End, taking action as usual as I tiptoed cautiously along the icy pavement. • Jake Arnott’s The House of Rumour is published by Sceptre.